I’ve been at this a long time. Paleo is an important part of my life and at this point, non-negotiable. Yes, from time to time, I will, or have to, eat something that’s not part of my usual paleo diet. This weekend, for example, I attended at wedding at a beautiful vineyard is Paso Robles. I prepare for these situations by eating a small meal ahead of time, or bringing along a paleo approved snack just in case. But sometimes, as much as you prepare, you get caught up in the moment, you stray, if only for a few bites. It’s important that you know your body’s limits with non-paleo foods: I react immediately to corn and wheat with digestion distress, sugar gives me a headache, but dairy, I can handle. Caesar Salad with a bit of parmesan cheese, okay. Pizza, no, definitely not. Meatballs – let’s gamble. I know there’s wheat in meatballs, just how much, I just don’t know. But, people were raving so I had to, and I was starving. It was worth the mild discomfort. Now, let me talk about Gluten Free, because there was a time when I tried to negotiate this lifestyle and introduced gluten free products into my diet, just for the sake of assimilating in social situations. Sometimes gluten free products are worse because of the high corn content in them. Does’t work for me. There are gluten free products without corn, but if it’s a baked good, you’re fooling yourself if you think you can try it and not feel it to some degree. Substituting corn for wheat is not the answer and certainly makes me suffer. As this blog is called paleobreakfast.me, I was inspired to show readers ways to reinvent their high carb, high sugar breakfasts. While I still feel like substitutions are not a long term tool to reinventing your meals, sometimes there are times or moments when a true paleo substitute would be very welcomed. There’s no need for worry any more. Meet Simple Mills Paleo Pancake Mix. It’s a blend of Almond Flour, Arrowroot, and Coconut Flour, which you might see in other paleo pancake mixes, but this creates a tastier pancake than others I’ve tried. It browns and behaves more like standard pancake mixes do, and seem lighter than those containing tapioca starch. At only 18g carbs per serving of two, four inch pancakes, it’s still a reasonable breakfast side. But, maintain control. Dumping on the Aunt Jemima high fructose corn syrup, or whipped cream, will defeat the purpose of enjoying this familiar favorite while staying true to your paleo self. **Whole Foods carries a number of Simple Mills paleo approved products like crackers and pizza dough mix. too. Every once in a while I’ll splurge on a new product, but only after I’ve read a great review and feel inspired to do so. In this case, I stumbled upon Fatworks, on Facebook, read all about them, read about their products and other reviews on their products. Fatworks processes and packages natural, grass fed animal fats for cooking. They happened to be offering their Pure Tallow and Duck Fat on sale. If you’re currently on a paleo journey, once you’ve managed to eliminate all the grains, dairy, and sugar from your diet, you’ll begin to look at the source of all your foods and begin to identify where you can continue to make improvements. Eventually you’ll come to the point when you realize the meats you eat should also be raised without grains. 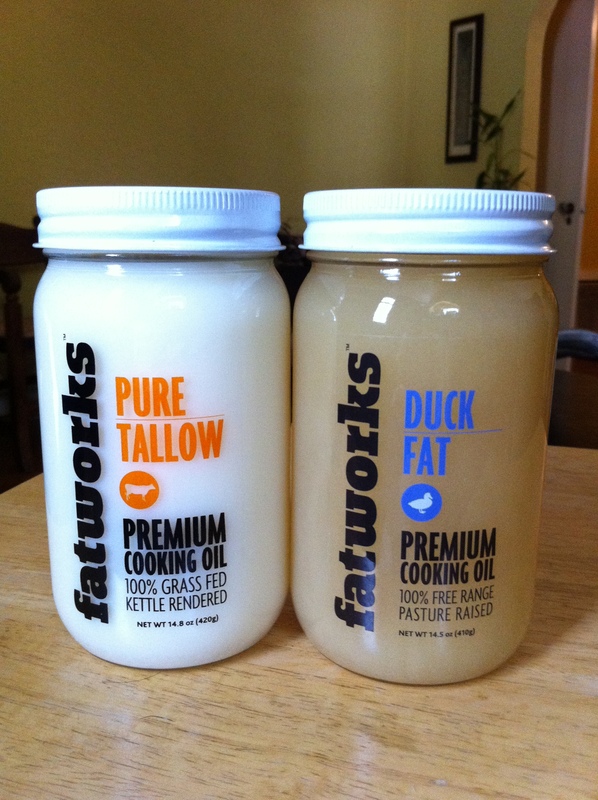 I was on a quest for corn free, soy free poultry products when I discovered Fatworks Duck Fat. Why is this so important? Omega 6 fats are much higher in corn fed, grain fed meats. Omega 6/Omega 3 fat ratios in our intake is a key element of the paleo diet. Please read about Omega 6/3 imbalance on my Favorite Links page. Besides these animal fats having less Omega 6 fats in them, they also taste better than conventional cooking oils. I’m a firm believer that enjoying your food is essential to any successful diet. If you don’t enjoy your food, then you’re less likely to maintain your food routine. In addition, chewing and salivation is critical to your digestion process, and getting the nutrients you need from your food. If your food doesn’t taste good, you will not salivate, nor will you chew long enough to begin the digestion process properly. Great tasting food equals better digestion. All that aside, these fats taste great! Over the past week, I’ve used them in many dishes: sautéing, roasting, searing, basting, grilling. Normally, I use olive oil for everything. This week alone I’ve used tallow and duck fat with eggs, ground beef, chicken, turkey, parsnips, brussels sprouts, onions, mushrooms. Try it everywhere and anywhere. Here’s what I learned. 1) In designing your dinner, use fat in one or two dishes, not every dish. A little goes a long way. Usually, if I’m sautéing one component, I’ll roast or steam the other. You don’t want all your food tasting similar. Change it up. 2) Introduce an acid. Somewhere on the plate, if you’ve got animal fat, balance it with a nice acid: lemon, lime, berries, greens, vinegar. Be fearless. One thing’s for sure, these are great products: tallow and duck fat from grass fed beef and ducks. Enjoy them! Julian Bakery is my new friend. 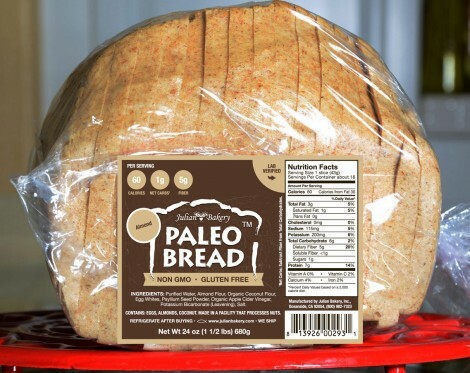 They produce low carb and paleo bread products in La Jolla, California. At the time I discovered there Paleo Bread, I had not had anything resembling a piece of bread in 18 months. Needless to say, it was a very exciting time. Biting into a crust of bread, for me, is a food lover’s dream. Julian Bakery has two Paleo Bread options. One is made with almond flour, the other made with coconut flour. The almond flour bread has 60 calories per slice vs 35 in the coconut . Fat is also higher in the almond flour bread with 3 grams per slice vs. 1 gram in the coconut. If you’re watching your calories, I suggest taking this into consideration. To me, the nutty flavors in the almond flour bread are much more pleasing than the coconut. The sodium is also 5 mg less in the almond vs coconut. At 70 mg per slice in the almond, it’s a price to pay if you’re strictly sodium free. These slices are a lot smaller than your standard slice of bread so if you’re looking for that giant sandwich experience, it won’t happen with this bread. You could use a few slices to make a half of a sandwich, though. Still, it’s a much better alternative than regular bread. I like French Toast so I was very excited to be able to make this breakfast treat using the Julian Bakery bread. I noticed the egg absorption was pretty good, something I hadn’t experienced in past attempts to make French Toast with other gluten free breads. Egg helps produce a fluffier piece of French Toast so absorption is important. Finally, priced at $7.99 on their website, it’s a little pricey but totally worth it. I purchased mine at Whole Foods for $9.99. The bread is good in your freezer for up to 3 months so to have a slice or two on a whim without having to rush through a whole loaf is a great option. One of the most frequent questions I get is, “What can I snack on”? Snacks are a challenge. Most dried fruits are sold, coated in sugar, and even when they’re not, they’re much higher in sugar than desired. Nuts are high in fat and you really shouldn’t eat more than an ounce when you do. Thinking about protein snacks, I use to carry hard boiled eggs around, but eating those every day could lead to cholesterol issues. In addition, finding corn free, soy free eggs can be a challenge depending on where you live. Beef jerky is an obvious choice but most available jerky is marinated in soy sauce and high in sugar. Most beef used in processing jerky snacks is corn or grain fed, too. The folks at Epic have been able to produce something for the paleo enthusiast: a grass fed, soy free, gluten free, dairy free, no added sugar snack. Reasonably priced at $2.69, Epic makes three bars: bison, beef, and turkey. They are each very different from the other. This bison bar is mixed with bacon and cranberry. This is the only bar that has added sugar in it, due to the cured bacon. Cranberries are already a sweet addition so this bar is too sweet for my liking. Since it was the first of the three that I tried, it could have been that my palette was expecting something a little more savory. But, another thing I thought could use some tweeking was the texture. It was just a little softer than I wanted it to be. Again, with jerky and slim jims being my only point of reference, a bar with the firmness of a medium-well burger, was a surprise. The grass fed beef bar was much more to my liking. The flavor of habanero and cherry was quite different and even though it measured 9 vs. 8 grams of sugar against the bison bar, it seemed less sweet because of the habanero. The texture of this bar was a lot more firm, too. A lot more to the bite, all the way around. It felt what I expected out of a beef bar. The turkey, almond, cranberry bar was my favorite. This felt like a much more familiar snack bar. This bar has higher protein, less sugar, and less fat than the other two bars. Because of those things, it feels a lot lighter, too. The flavors were better balanced in this bar. The added almonds made it a little less meaty, as well as somewhat crunchy. I will definitely continue to stock these bars as hearty snack options. post workout or while traveling. www.epicbar.com Update: I have since found out from Epic that the turkeys are on corn feed, and possibly soy, so I will stick to the Grass Fed Beef bar as the best choice among the three. Update #2, July 31, 2014. The Epic Bars are now sold at Whole Foods, making them a lot easier to get now. I noticed they added a new flavor: Lamb, Currant-Mint. The bar is about 6 grams or 15% smaller than both the Beef and Bison bars. 10 g protein, 9 g carbs, 9 g sugar, 140 calories, 230 mg sodium. It is tasty. Just savory enough for me, and has a good texture. When I first tried these, they were a lot softer and more like a cold burger patty than a piece of chewy jerky. Now, the bars are $2.99 and I believe why the lamb bar is smaller. Not for fat, which is what I initially presumed, rather cost. After all, a single burger at In & Out is only $2.42 and although I’d rather eat a real burger, although it’s not grass fed like the beef, lamb, and bison used in the Epic Bar are. Really enjoyed your review of the fats and how to prepare all the dishes in one meal in a different way. Keep up your great work. I’m converting to paleo in my own not-so-fast time frame, but I have cut out sugar, grains and most recently, dairy, from my diet. Our meeting 2 months ago really made an impact on me!